Perseus (the son of Zeus) is an earthling having to save Andromeda. But to get there, he has to face many obstacles like defeating a range of monsters, and facing all manner of dangers thrown in his path by the sea goddess Thetis. However, his quest is tackled with his wits, and some help from Zeus, his flying horse Pegasus, a mechanical owl, his shield, sword and invisible cloak. 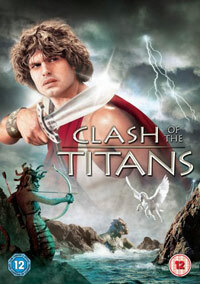 An adventure of amazing proportions catapults the viewer into a highly entertaining Greek mythological fantasy. I'm so glad this 1981 classic got a DVD re-release in time for the 3D remake - not only to make people aware of the original, but also for those who still enjoy their movies with real, physical stop-motion animated creatures added to live action sequences, as opposed to total digital engulfment. As with some of the more memorable Sinbad movies and Jason And The Argonauts, legend Ray Harryhausen's stop-animation talent gave these movies a very unique life. 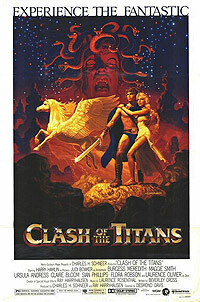 Even though the digital creations of today is highly detailed, there is something about the imperfect stop-animation that adds realism and true character to everything from a flying Pegasus, snake-headed Medusa, multi-headed dog-beast, gigantic Kraken sea creature and more, which Perseus has to face in Clash Of The Titans. A welcome bonus feature has Harryhausen talking about his craft.